For artist Ed Mell, the world of plays and musicals is no competition for the theater of nature. Whether capturing a cactus and making it undulate, or conveying the force of a desert storm, Mell’s signature works bring the earth to life and encourage viewers to appreciate its grandeur. Nathaniel Owings, owner of The Owings Gallery in Santa Fe, New Mexico, has been showing Mell’s work since 1985, and has watched the artist evolve. “Ed is a complete original. He does his landscapes and people and horses like no other and in his own time and style. … He makes a very stark and dry landscape look lush with clouds and running shadow and water and arroyos in ways that no one else does. Others have tried to copy his style but they never quite touch his magic of wanting to go to the places he paints,” Owings says. The longtime colleague is enchanted by Mell’s mastery of color and light. “I am convinced that these are not separate entities in Ed’s mind. He possesses a special understanding of these two elements that enlivens every subject he explores.” Surrounded by cowboy memorabilia, art books, Navajo rugs and photos of potential subjects, Mell creates his majestic paintings. While his canvases convey a sense of motion and continuity, they offer the viewer that magical amalgam of mystery and wonder. Like all fine art they engage the senses and Leave one wanting more. With its comfortable clutter, Mell’s studio is both sanctuary and muse. His paintings seem almost animated — like the dancing brooms in Walt Disney’s Fantasia, but without the cartoonish elements. “I think my work leans toward the abstract as I get older,” Mell says. “But I draw from both worlds. I’m exploring, trying to do justice to our incredible surroundings.” Critics have compared his work to that of famed artist Paul Klee, who felt that painting is not the replication of reality, but the invention of reality. Mell counts among his mentors Maynard Dixon and the Taos Founders. Like Dixon, Mell began as an illustrator, an experience that informed his confidence in light and color. He recalls doing posters for rock-and-roll bands with the goal of becoming an automobile designer. But a trip back to Arizona’s Hopi Reservation to teach in 1970 fueled Mell’s frontier spirit, and he yielded to the variety and beauty of his birthright. “I love watching the mesas and canyons,” Mell says. “I enjoyed my time in New York and Los Angeles, but I never intended to stay there. I missed the wide-open spaces, the ‘frontier vibe.’ I need the desert for the freedom to do what I want.” Mell is the middle link in three generations of artists. His father, Edmund, and both of his brothers were artists. In turn, Mell’s sons both pursued artful careers. Taylor Mell is a painter in Albuquerque and Carson Mell is a budding filmmaker in Los Angeles. While his paintings have garnered national attention, Mell sculpts as well. His famous bucking bronco bronze, Jack Knife, is a competition winner that stands front and center at the intersection of Scottsdale’s Marshall Way and Main Street in the heart of the arts district. In addition to painting and sculpting, Mell maintains his connection to cars. The one-time auto designer collects and restores vintage autos. He owns seven cars — all drivable and five of them vintage: a 1962 Corvette, a 1963 Corvair, a 1965 Triumph TR4, a 1963 Buick Riviera and a 1936 Cord Sedan. “The Corvair is identical to the one I drove at junior college in Phoenix,” says Mell. “I suppose I’m revisiting my long-ago youth,” he laughs. Admirers of the artist’s work enjoyed a major exhibition in 2010 at the Tucson Museum of Art, which then traveled on to Flagstaff, Atlanta and the Forbes Building in New York. An upcoming 2012 show will hang in Scottsdale’s Overland Gallery from March 1–10. Gallery director Trudy Hays is delighted to bring his work — including landscapes, animals and figures — to admirers and collectors alike. 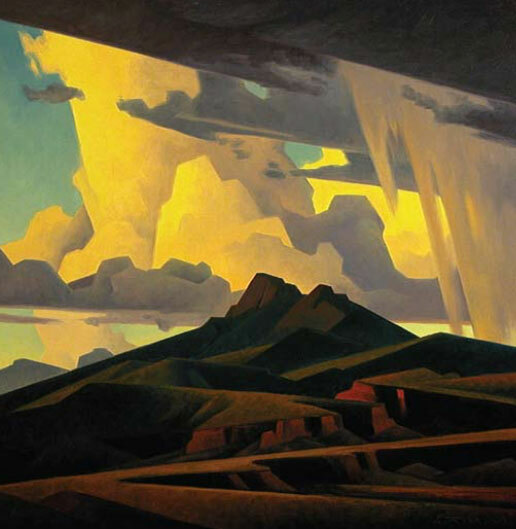 “We consider Ed Mell one of the leading artists of the‘New West,’” she says. Despite his prolific output and critical acclaim, Mell is modest about his accomplishments. “I’m not comfortable talking about my own work,” he says. “I think it is presumptuous of an artist to do so. I leave the descriptions to other people.” Sublette is more than willing to talk about Mell’s work and the impact he has had on the art world. “Ed Mell is one of those rare individuals that will be written about and studied 100 years from now. 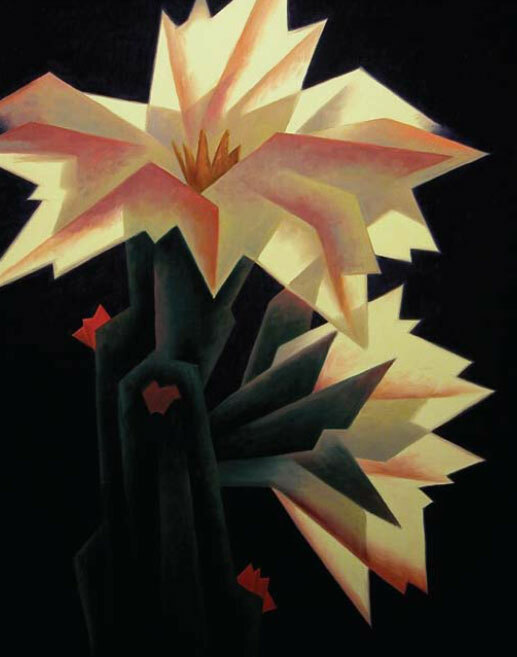 His unique style, composition and superior painting skills have given him a place in the pantheons of the great 20th-century artists,” Sublette explains. “He continues to have sell-out shows and museums clamoring to add his paintings and sculptures to their permanent collections,” he adds.